When a developer like True Axis, creators of the iOS classic Jet Car Stunts ($1.99), announces a new project, you take note. That’s why when the studio announced back in February that they were working on a skateboarding simulation called True Skate, it shot right up into our most-anticipated games list. Well, it did in mine, anyway. I’ve been skateboarding for the majority of my life, and have really been waiting for a killer skating app to come to iOS. Well, it’s finally come, as True Skate ($1.99) is exactly the kind of skateboarding game that I’ve always wanted. Rather than being heavily mission- or story-based like the Tony Hawk’s Pro Skater series or EA’s Skate series, True Skate is more of a sandbox toy that lets you shred around a well-designed skatepark doing whatever you feel like. There’s a short list of missions to complete, and there’s plenty of potential to flesh out the entire experience further, but on release True Skate is simply an excellent physics-based skateboarding simulator that’s only real limit is your imagination. 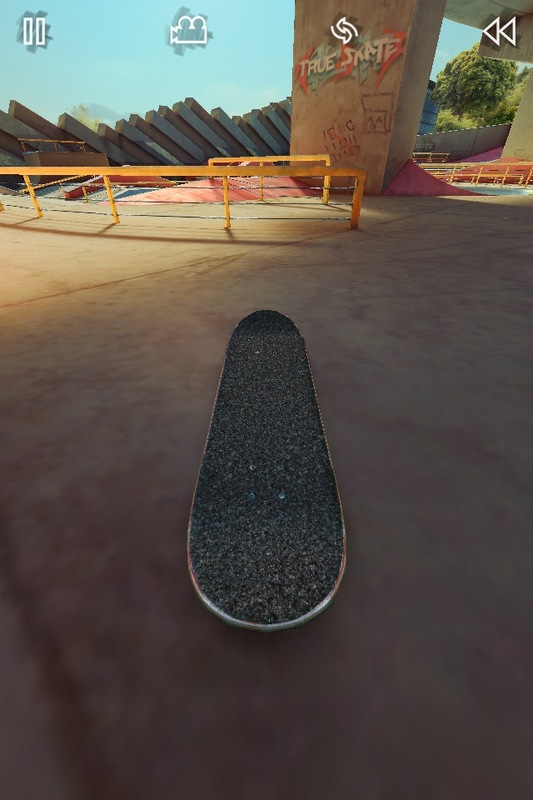 Unlike other skating games, True Skate doesn’t have you playing as a person skating around the open world, rather you control the skateboard itself and your fingers act as the skater. Inevitably it will draw comparisons to Touchgrind ($4.99), as that’s really the only similar title on iOS that’s ever made any sort of splash, but it’s important to note that the two games are quite different from each other. Touchgrind had a strictly top-down view that made it very difficult to see what you were doing or where you were going. As such, you were mostly stuck with trying various flatground flip tricks or the occasional attempt at a grind or slide if you were lucky enough to line up with the object correctly without knowing exactly where it was. Touchgrind was neat to be sure, but quite limited, and it failed to give me the feeling of actually skating around a real open skatepark. In True Skate the view is pulled back to basically a 3rd-person behind-the-board camera angle, and it changes everything. Now you can see where you want to go and what objects you want to hit up, and when you land something you can just continue on to the next thing and string together a nice line of tricks. It feels like the whole park is at your fingertips and it’s really up to you on how you choose to tackle the terrain. It’s a very liberating feeling, playing True Skate. Control-wise, True Skate works very similar to Touchgrind, using various swipes and flicks to perform tricks with your board, and everything is based on how the physics of real skateboarding works. Tap down on the tail to pop the board up and then quickly level it off to perform a nice ollie, and like real skating every other trick branches out from there. Ollie and flick the side of your board to kickflip, or scoop down on the tail in sort of a “U" shaped swipe to do a varial. Likewise grinds and slides are simply a matter of ollieing and positioning your board over the object properly and pushing down in the correct spot on the board. For example, ollie at a slight angle over a rail and push down on the front of the board to lock into a crooked grind, or ollie at 90 degrees over a ledge and push down on the tail to perform a tailslide. It can be tricky, and will take some practice before things start to click, but eventually they do and you’ll be surprised with how many different tricks are possible by combining the various flips and grinds in the game. 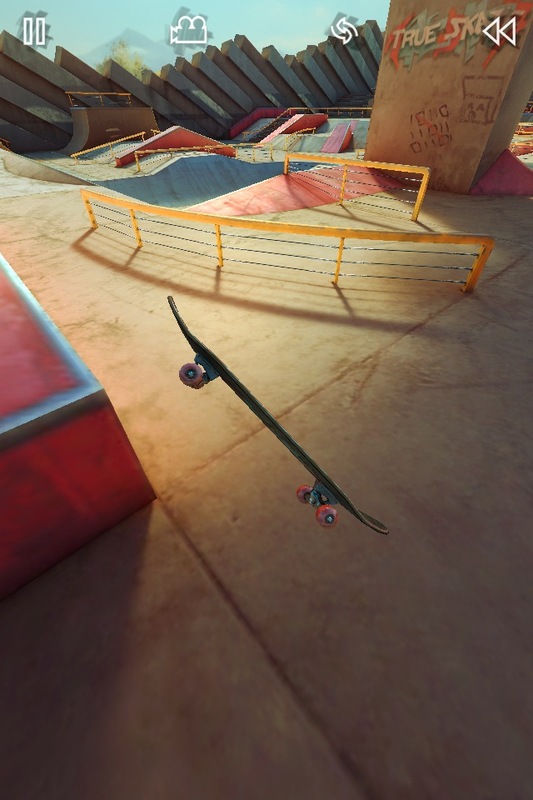 True Skate does a better job than any other iOS game that I’ve played at making you believe you’re really manipulating a little virtual object with the touch screen. And this is really where True Skate shines. It offers the kind of freedom to do whatever the heck you want just by giving you the core tools you need and letting you loose inside its sandbox world. There’s something almost dangerously compelling about this for me, and I find that I can’t help but play True Skate whenever I have a free moment. The physics engine and controls are strong enough that even a skateboarding neophyte will be busting out cool tricks with ease once they grasp the mechanics. Where I think True Skate will really hit home, though, is with people like me who are actually into skating. There’s nothing more satisfying than thinking “I want to kickflip over that pyramid and land in a backside tailslide down the rail", and then actually doing it. Oh it might take you dozens of tries, but I assure you it’s possible and when you finally pull it off it’ll be tough not to let out a yelp of victory. It’s moments like this that are a pure rush, and True Skate is filled with endless amounts of them for those dedicated to really explore what’s possible. I could go on and on about how much I’m enjoying True Skate, but the fact is that it falls more in the “toy" category than the “game" one, and that might not be enough for some players. There is a handful of missions to complete, but they mostly feel like tutorials since they walk you through various things that help you get in tune with the gameplay. A much more robust mission system would be welcome for those that like their games to have specific goals to complete, and it sounds like that’s something that will eventually be expanded upon in the future. Another big feature I feel is missing is some sort of replay function. It’s an incredible feeling to pull off some cool trick, and it’s the sort of thing you’d want to be able to save and relive or show off to your friends. There’s already a slick rewind feature built in so if you mess something up you can just backtrack and retry, but there’s currently no way to rewind and re-watch something you just did. The ability to upload these replays to YouTube would also be nice, to make sharing your moments even easier. Also, there’s just the one skatepark environment in True Skate. It’s a great park, with a great flow and mix of different obstacles to hit, but it’s bound to get kind of stale skating in the same place all the time. 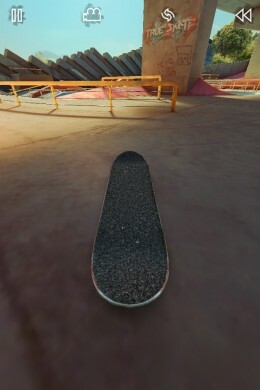 I’d also like some sort of board customization, as you’re currently limited to just the generic True Skate board. More boards with different attributes and an upgrade system could really kill two birds with one stone, offering a way to reward mission completion with XP that then goes towards upgrading your collection of boards. Just a thought, but that goes to show just how much potential the solid base of True Skate has, and it sure sounds like True Axis is on board with plenty of ideas of their own if the game is popular enough to warrant frequent updates. In the end, True Skate‘s list of back-of-the-box features leaves a lot to be desired. You get one park, one skateboard, and a handful of different goals to complete, which really won’t take very long at all and mostly serve to get you acclimated with playing the game. But that’s the thing: once you are acclimated, the game instantly opens up with near-limitless possibilities, and that’s what I’ve enjoyed most. Some gamers aren’t interested in sandbox-style experiences, and you might want to hold off and see how True Skate evolves over time. But even if that’s the case, for a couple of bucks this is one of the most unique games in the App Store, and a real showpiece of what a touchscreen device is capable of. That alone is likely worth the small price of admission for most. True Skate is clearly something special. It feels like the kind of game that our touchscreen devices were made for, and looks gorgeous to boot. If you’re into skateboarding already I’ll just tell you flat out: buy this game, you will fall in love. If you’re not heavily into skating then chances are you’ll like True Skate a lot too, as long as the lack of structured goals isn’t a deal-breaker for you. For me, it’s the sheer act of playing that keeps me coming back, and players in our forums have been loving it as well. 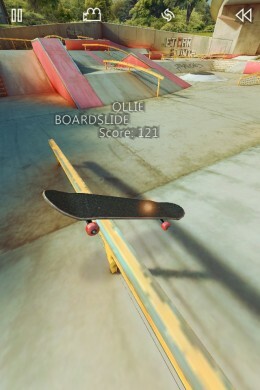 I have no doubt that True Skate already bests all other skating games on iOS, and has the potential to grow well beyond its stellar foundation. For another look at True Skate in action, make sure to check out our recent TA Plays video of the game.